A learned journal paper on Universal Credit by our team members has proved so popular that the publishers are offering it free for a month. 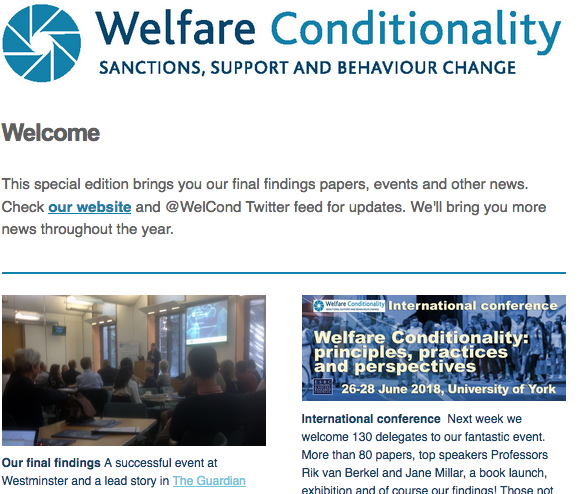 ‘Universal Credit, ubiquitous conditionality and its implications for social citizenship’, written by Prof Peter Dwyer and Dr Sharon Wright, considers the punitive system of tiered sanctions and fines within Universal Credit. They argue UC represents a major expansion and intensification of personalised behavioural conditionality, and indicates the ubiquity of conditionality at the heart of twenty-first century UK social citizenship. The paper was one of the most downloaded from the Journal of Poverty & Social Justice in 2015. In celebration, the journal is making it free to download this month. Get your copy here. Prof Dwyer is based at the University of York and Dr Wright at the University of Glasgow.